Plans have been lodged to redevelop the Queen's Head in Bridge Street. A planning application has finally been submitted to upgrade a prominent building in Morpeth. But residents living next to the Queen’s Head in Bridge Street, which dates back to 1656, have raised concerns over the scale of the proposed works and the issue of parking. Others have welcomed the move, saying it will be good for the town. The former coaching inn had been boarded up since 2013 and its owner first mentioned what works it was looking to carry out in 2014. And now Crafted Projects – the rebranded leisure division of Ladhar Group – has submitted a bid to erect a new five-storey building, although it says it would retain the Bridge Street facade. The first phase of the development would be the introduction of the company’s Pleased To Meet You brand into the ground floor of the premises. This concept was developed in Newcastle as a gin, draft and cocktail bar. The second phase would lead to the development of a 43-bedroom boutique hotel on the upper floors and the creation of multi-purpose function facilities linked to the hotel. An event hall with a capacity for 400 people, to be primarily used for weddings, is the main one. Others include a bar/restaurant, tea room unit and spa. The proposals incorporate 12 parking spaces within the curtilage of the development, two of these are disabled parking spaces, and the applicant says that people can also park in the adjoining public car parks to the rear of the property. Among the objectors is Joyce Templey, who lives in Richard Hollon Court. Her response says: ‘This proposed monstrosity will be totally out of character in the market town Morpeth is famous for and obliterate all natural light into my property. ‘My view at present is not wonderful, but I would rather look at a brick wall than have people staring into my property day and night. Fellow Richard Hollon Court resident Mark Saxton said: ‘There are not enough parking spaces in the plans for visitors and residents to the Queen’s Head. Letters of support have also been submitted by people living elsewhere in Morpeth, including from Christopher Graeme. His response says: ‘The scale of the hotel compensates for the real lack of accommodation in Morpeth. It is unique and will attract tourists and business clients to the town, which will lead to spin off investment for the town. 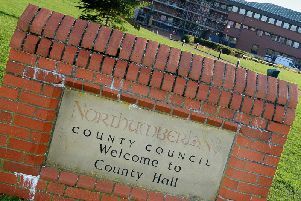 Some responses have been classed as ‘neutral’ by the Northumberland County Council planning officers, including the one from Ellen Arnott. She says: ‘It’s about time something was done with the Queen’s Head Hotel and I think the plans for a new hotel look fantastic. Crafted Projects says the existing structure is in a poor condition and demolition is necessary for it to be re-developed. The proposals ‘will reflect a heritage led approach, albeit incorporating a new building development within the burgage plot behind the retained facade to Bridge Street’. To see the plans, go to the planning section at www.northumberland.gov.uk and search with reference number 16/02233/FUL.